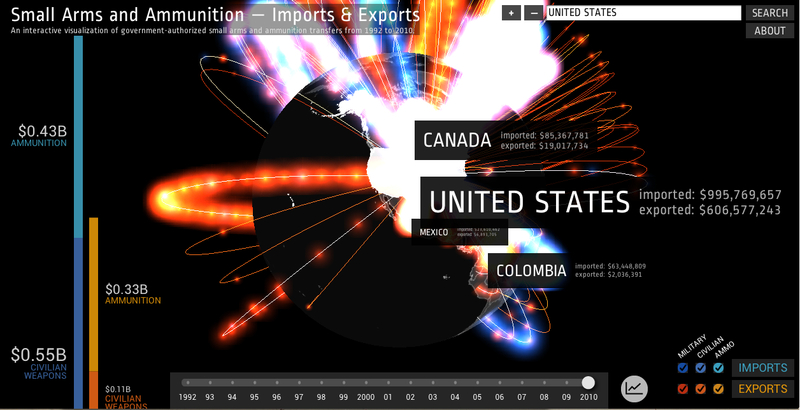 I was scanning the Huffington Post this morning and came across the headline Global Arms Trade From 1992-2010 Visualized By Google. Tech, arms trading, and maps; sounded interesting since small arms control is something I’m deeply interested in. Using the NISAT database, PRIO, Google and the Igarape Institute got together and created an interactive map of the global arms trade since 1992. Frankly, it’s one of the most user friendly and engaging pieces of data visualization I’ve seen. It takes a topic that can be opaque and complex, and with a user friendly interface creates a tangible narrative about the arms trade over time. Why is this so important? To start with, most contemporary wars are not being fought with high tech weapons; most of the killing and maiming these days is done with small and light arms, and to a lesser degree artillery, and mechanized weapons (e.g. tanks, armored personel carriers, etc). Along with the fact that most contemporary violence is done with small/light arms, the lack of research in the peace and conflict resolution field on the effects of small arms on peace and stability is notable. Often treated as a security studies, military, or legal issue, there is relatively little I’ve been able to find on long-term impacts of small arms on social stability and peace, other than self-evident analysis that more arms lead to increased likelihood of conflicts restarting. The small arms trade is complex, both from an economic and diplomatic perspective and only becomes more so when one tries to unpack the economies of illicit arms trafficking. This tool provides a superb visual entry point for someone trying to develop an understanding of how arms have flowed globally over time. Along with the data, the map itself is superbly designed. Clearly the folks at Google worked hard to create an excellent user interface. The old days of rather brutish GoogleEarth layers have given way to a website that is easy to manipulate and understand. The timeline is quick to react, and data updates quickly. Most importantly, I was able to make use of all the content and functions almost immediately; the site is very intuitive. Organizations who are trying to leverage data visualization in their work could learn a variety of lessons from this tool. So what are the caveats we should be aware of when using this tool? To start with, PRIO is probably one of the most reliable aggregators and producers of large-N conflict data sets, and this reliability stems from a conservative approach to data gathering. For those who have seen their data on conflict mortality, their methodology for categorizing a battle-death has sparked some serious debates in my classes at the School for Conflict Analysis and Resolution since it leads to massive under-estimates of actual mortality in war zones. Thus, if you look at this map and think “that’s a lot of arms and ammo being traded,” then it’s worth noting that there’s are a lot more arms flowing than are reported on the map. PRIO doesn’t count illicit arms flows in the totals, as Igarape points out here there is no shared method for categorizing small and light arms internationally, and many nations obfuscate and under-report arms flows for strategic reasons. Another problem, and this is more related to a dearth of research in the peacebuilding community, is the lack of analysis of the effects over time of different types of small arms on societies trying to rebuild after war. When we think about the human and social consequences for communities and societies recovering from conflict, not all small arms are created equal. This is where ArmsGlobe could find value beyond just demonstrating the movement of materiel. Let’s do a comparison; I apologize up front for what will be a disturbing paragraph. An AK-47 is a far more deadly weapon over time than, for example, an FN-SCAR or M4 carbine. This is because of ease of use, availability, and shelf life. There is a preponderance of AK-47s since they can be buried for years, dug up, loaded by an amateur, and fired. They fire a 7.62mm round at 600 rounds a minute that under the best circumstances suffers from significant “yaw effect”, meaning that over the flight of the shot the bullet wobbles and impacts a body at sub-optimal angles for a kill shot. Instead it shatters bone and tears apart tissue in such a way that the target is badly injured but in many cases won’t die. An inaccurate shot (which most will be) is going to cripple instead of kill. The FN-SCAR or M4, though, fires a high-velocity long-range 5.56mm round that causes rapid ‘bleed out’ and is usually being fired by a professional soldier who’s likely to hit a target in the optimal space between the bottom of the sternum and the head between the shoulders; someone hit by a 5.56mm round on the battlefield is probably going to die. Using this logic the long term social costs of a 7.62mm round that cripples and has a much higher destructive capacity on impact with buildings and infrastructure could be much higher than 5.56mm ammunition. Bullets hitting bodies is a profoundly disturbing thing to think about in such instrumental ways, but it can tell us a great deal about how different small arms will impact long term issues related to public health, capacity for renewed violence, rebuilding costs and investment risks when a war ends. The ArmsGlobe map could serve as both a platform for tracking arms and ammo flows as well as a space for building second-level data layers about the human and economic costs of arms flows in different countries. The ArmsGlobe project provides an excellent starting point and platform to build on when trying to create a visual space for the public to understand the small/light arms trade. It also provides researchers a place to build out data on arms and ammunition flows, which have significant effects on wars as they unfold and on societies who must take care of the survivors and rebuild when the fighting stops. Most importantly, it can be a space for public debate where experts and citizens alike can begin to come to grips with the size and nature of the small arms trade, and start trying to find long term solutions to stop the horrific violence that small arms sow.